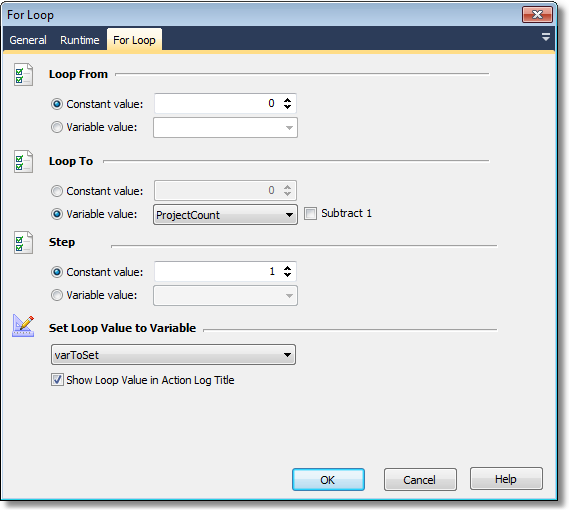 The for loop action allows you to iterate a variable across a range of values. The For Loop action is actually an iterator, so all information from the general section on iterators applies. The initial value for the loop value. The value can be either a constant or a FinalBuilder variable. The 'to' value can be either a constant or a FinalBuilder variable. If using a variable, then checking the Subtract 1 checkbox will loop to 1 less than the variable value. The loop value will be incremented by this amount after each iteration. The value is incremented before it is evaluated against the 'to' value. The Step value can be positive or negative (or zero for an infinite loop), and can be either a constant or a FinalBuilder variable. Specify a FinalBuilder variable to use for the loop value. If no variable is specified, the loop value will be stored internally. TIP: If you use FinalBuilder variables for any or all of 'to', 'step' and 'loop value' values, then it is possible to change the values (either from actions or scripts) while the loop is running.